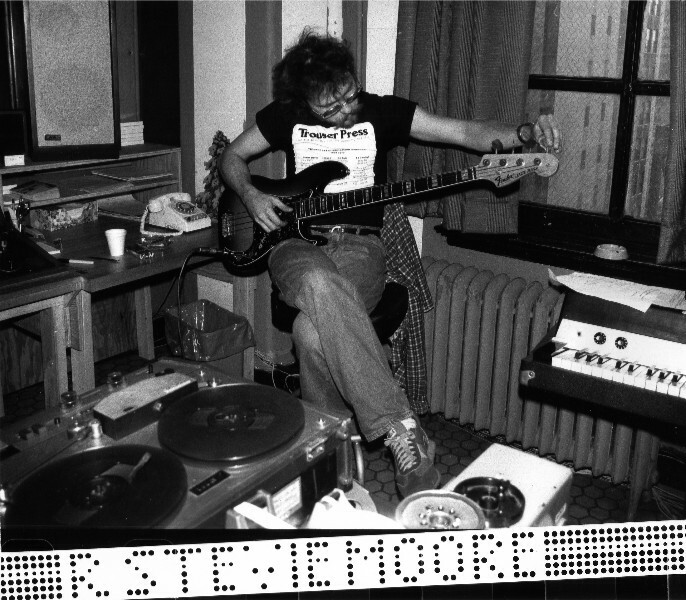 I've undergone a real R. Stevie Moore obsession over the last six months or so, and I'm considering writing a big article about him for Blogcritics soon. In the meantime, here are some very short reviews for each of his albums I've listened to, for anybody who's looking for a place to start in this guy's absolutely endless body of work. This list is only his official album releases, and does not include any of the tapes, which are honestly usually just as good. Perhaps that will warrant another blog post later. For those wanting a quick idea of who R. Stevie is: He's generally known now as the grandfather of home recording, a struggling lo-fi musician who was at times a struggling stereo-quality musician, with many albums to his name of amazing songwriting and virtually no fame or fortune to show for it. He should probably own a record somewhere as the world's most prolific songwriter, operating at an extremely quick pace since the late 60s and he's still releasing multiple CDs this year. Phonography (1976) - His first album, very recently re-released on vinyl. In a way still the quintessential R. Stevie album, undeniably lo-fi and undeniably great pop. Goodbye, Piano is an inexplicably perfect combination of falsetto singing and an out-of-tune piano. I Wish I Could Sing is the other highlight for a pop-centric listener, despite the self-deprecating message. Getting away from pop for a second, this is as far as I know the only place to hear Moons, which I think is completely unappreciated in Moore's catalog though it captures a certain odd mood of mine perfectly. There are a few more spoken word interruptions than one might want, but they define the album's mood better than the songs themselves and can't simply be discarded. Delicate Tension (1978) - No doubt one of the best. On Side One alone, there's simply no reason Cool Daddio and Schoolgirl shouldn't be quirk pop hits, the music is flawlessly executed pop and the lyrics find just the right degree of oddity. Side Two starts off with two punk pieces with fairly bad recording and production quality using very simple song structure and nearly nonsensical lyrics, yet they stick in your head all day, and that's a good thing. The remainder of Side Two cycles through too many music styles and emotional states to mention, really classic Moore here. Everything You Need To Know About R. Stevie Moore But Were Afraid To Ask (1984) - A "Greatest Hits" album, but then if you count his tapes then almost all of these are effectively Greatest Hits compilations, so not a legitimate difference. Four sides of quality RSTVTunes that don't seem to be organized in the most coherent way, but you virtually can't go wrong, this really is the Best of R. Stevie to this point. Wish I had a vinyl copy so badly. What's the Point?!! (1984) - The first of R. Stevie's album with its own consistent feel since Phonography, and the production value is significantly higher by now (which is apparently a turn-off for some Moore fans, though I'll never totally understand that viewpoint). Generally aggressive songs, besides of course Puttin' Up the Groceries, a classic leading off Side Two. Though it's not the ultimate version on this album, Part of the Problem really is about his best pop tune. Verve (1985) - Somehow R. Stevie Moore managed to get a record publisher to put out Verve though it's more adventurous and odd than most of his personally distributed cassette tapes. It's not every track that takes the experimental route, but the ones that are experimental color the rest in one's memory, so every time I listen to this again I'm shocked by how good it really was, always expecting to hear the drumming and screaming of Feisty Schoolmarm more than anything else. Still, if you're going through R. Stevie's albums, you're probably looking for the pop, and this has the lowest percentage of that of anything on this list, but don't count it out entirely. Glad Music (1986) - Possibly the best. Hovers just below typical studio quality on average and just blows you away with each new track. Part of the Problem, I Like To Stay Home, and Colliding Circles could be incredible headliners on any other album, and the album ends with Time Stands Still and The Strange, two not especially similar tracks that still work so well together that I can't unlink them in my mind and they're my favorite end to an album since the Abbey Road Side B Medley. (1952-19??) (1987) - This one off Cordelia Records is significantly less professional in tone than the two that border it (Glad Music and Teenage Spectacular) and it's not essential listening like those other two are, either. However, this album includes three of my favorite songs (Jesus Rocks, Treat Me, and Back In Time) that can't be found on any of the other albums on this list, and Side One in particular has a beautiful flow to it that I really enjoy. Very worth the low cost for an LP copy from Cordelia at this link. Teenage Spectacular (1987) - Possibly the best. Teenage Spectacular comes from the moment R. Stevie almost made it, a real professional record of new material for a serious record label with a consistent feel and studio quality production. Hobbies Galore is Moore's most sentimental would-be-could-be-should-be hit. All Well And Good/Love Is For The Birds is one of my favorites ever and it can't be found anywhere else. Who Killed Davey Moore is a Dylan cover that most wouldn't recognize as Dylan until they hear the words "gamblin' man," and it sounds unlike anything else I've ever heard, such an amazing mood to this rendition. If only it could've kept going. Warning: (1988) - Some higher production value re-dos of older tunes that don't really improve them combined with covers that range in quality. It's also short, so I wouldn't really recommend it, though it's still a fine listen. Has Beens and Never Weres (1990) - A second-best hits album. Yes, R. Stevie can do that and get by just fine. The LP was badly mastered to give the LP a distant sound, but otherwise still worth a purchase if it can be found. No, it's not as good as most of the others here. That's the point. It's a second-best hits album, and it's still got some essential tunes on it. Contact Risk (1993) - R. Stevie's compact disc comeback. Badass new-ish material first 3/4 of the album followed by a greatest hits final fourth. Remarkably good selection, only a few in the very middle of the CD drag or feel dated in the least, coming out of an era of music with a quick expiration date. Meet the R. Stevie Moore (2008) - Cherry Red Records produced a new double album of R. Stevie's greatest hits pretty recently, and I have to say, they came up with a ridiculously good tracklist. A very good starting point for pop while still giving you plenty of room to dig deeper into his other albums later and find the other veins of gold running through them. Focuses a lot on Phonography and Delicate Tension tracks, keeping relatively lo-fi without being restrictively so. I'm very happy with my Italian vinyl copy, thanks eBay!